Tatutina 1984 - 2014 Celebrating the Heart of Childhood for 30 Years! Tatutina has been celebrating the heart of childhood for 30 years. Although they incorporated in 1984, the business actually began in the basement of Barbara Ottmar’s home in the late 70’s in North Attleboro, MA. Barbara started hand painting children’s T-shirts and other garment items and selling them out of her home and to retail stores in Boston. She later opened a retail store in downtown Attleboro and sold her colorful products to the public for more than 10 years. By the late 80’s, two of Barbara’s daughters, Roberta O'Neill and Georgia Florena-Shaban joined the business and they began expanding the product line to hand painted wooden items for children and adults. 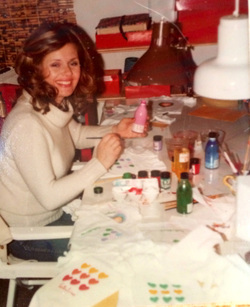 Georgia, who is also an artist, joined her mother in the artistic department and together they painted new products for the retail store. Roberta joined the company as manager and helped them expand the wholesale business by marketing their items through trade shows and catalogs. Over the years, the product line grew to include hundreds of items for gift giving and home décor. Barbara’s art and paintings started on Italy’s Amalfi Coast. She was inspired by the Mediterranean traditions, colorful characters, and family togetherness found along the coast near her relative’s homes. Barbara lived there with her late husband, Salvatore, who actually gave her the nickname, Tatutina. She decided to sign her art with her signature logo and then decided to use it as the name of her business. Georgia grew up painting and creating with her mom, Barbara. She would start each day with the question, “What are we going to make today?” Presently, her inspirations include her pets, her home and bright colors. She loves to include everyday scenes with dogs and cats, and bold patterns with her original artwork. Both mother and daughter enjoy working together in one open studio. Tatutina’s classic wooden letter collection, also known as “Letterly Lane,” is a great example of that approach. They feature more than 60 unique wall letters to make personalizing a child’s room a colorful adventure in spelling a name or phrase. The idea was a true collaboration between Barbara and Georgia. Barbara drew the letters on paper and Georgia designed each one using her creative and colorful painted designs. They’ve always had a love for personalizing and adding names to anything. The Tatutina wooden bookends collection was also family inspired by their love of reading. “To make books special, you’ve got to treat them like the treasures they are,” says Georgia. “That means giving them a special home within your home.” This best selling category, Ready for Reading Bookends, is found in many retail establishments across the US. Another best selling item is called the “Take Out Menu Box.” It’s an organizational box that houses a collection of menus that a family or business can keep in one functional, “go-to” box. They made the Original Take Out Menu Box in 1999 by hand painting on a wooden stationary box, and it has been one of their top sellers for the past 15 years. Today, Tatutina is a nationally recognized children’s gift and home design company. By partnering with other manufacturers, expanding their online presence, and distributing their signature product line across the US, Tatutina has grown from a local retail business to a national company. Although the product line has expanded from a few hand painted pieces to hundreds of products, each creation has remained true to Tatutina’s original art with bold colors and signature designs. This woman-owned business distributes across the nation, yet the heart of the company is right here at home, in Rhode Island, in their Pawtucket studio. Each year, they open their doors and have a Studio Sale that features original art, great deals on their one-of-a-kinds, and closeout/sample products at greatly reduced prices.